DPWH Secretary Mark A. Villlar graced the occasion as the keynote speaker during women’s celebration in behalf of his mother Senator Cynthia A. Villar on Wednesday, March 14 held at the Activity Center, Capitol Grounds, Calumpang, Naval, Biliran. NAVAL, Biliran – Women employees of the Department of Public Works and Highways (DPWH) Biliran District Engineering Office participated the 23rd Provincial Women’s Congress on Wednesday, March 14 held at the Activity Center, Capitol Grounds, Calumpang, Naval, Biliran. 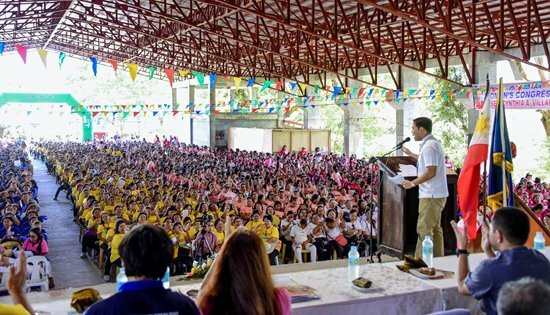 There were an estimated 3,000 women-participants coming from the 132 barangays, 49 sitios, and 186 chapters of Women for Rural Development – Katipunan ng Liping Pilipino (WORD-KALIPI) province-wide, Provincial Council for Women's Welfare, Incorporated (PCWWI) officials and members, women legislators and other women sectors in the province who joined the said activity. The event started with a holy mass followed with a parade going to the provincial capitol grounds for the opening and ribbon-cutting ceremony of the Trade Fair and the opening program. One of the highlights of the celebration was the plenary session/ discussions on interesting topics to provide participants with knowledge on promoting gender equality and empowerment. There were also slogan writing contest, dance contest and skills training simultaneous with the plenary sessions: skirting, stage decoration, marcotting and grafting, make-over and vermin composting. Other activities during the celebration includes the trade fair which showcased the livelihood projects of women. DPWH Secretary Mark A. Villlar graced the occasion as the keynote speaker during women’s celebration in behalf of his mother Senator Cynthia A. Villar. Senator Villar is known for providing livelihood programs to the people. Biliran Province is one of the beneficiaries of her legislation under Republic Act No. 10861 otherwise known as An act for the establishment for provincial fisheries and aquatic resources training, development, and product center. On his speech, the DPWH Secretary highlighted the strong support of her mother to the group of women. He also vowed to continue supporting the Biliran women’s organization especially when it comes to infrastructures and livelihood programs. The National Women’s Celebration every March is part of the worldwide observance of the International Women’s Day pursuant to R.A. 6469 series of 1996. This year’s celebration is in adherence with the theme “We Make Change Work for Women which shall be used from 2017- 2022.